Patricia is a lover of learning and movement. She started ballet in her primary years and was a complete fitness junkie in high school: Pilates, running, and football. She then went on to teach literacy to primary graders and further her studies in Psychology. During this time, she discovered Yoga, which she continually practices up to this day. Her yoga background is in Ashtanga and Yin. 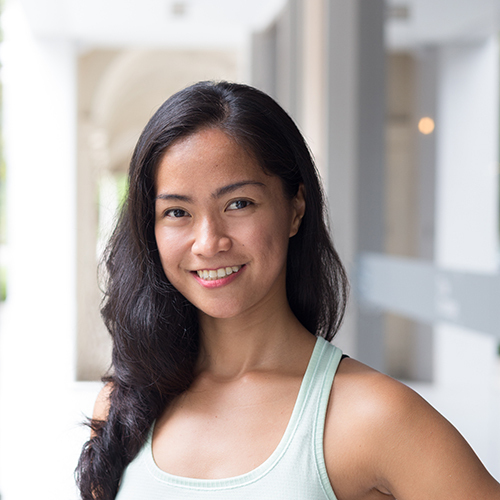 Her movement adventures did not end there, and she was given the opportunity to become a Barre instructor in Manila. She is eternally grateful for the different opportunities movement has brought her, allowing her to visit different places, meet people from all walks of life and get in touch with what she is passionate about. Patricia felt thrilled that she can continue teaching barre and yoga when she moved to Singapore. She loves the combination of strength, grace, musicality, and mindfulness in Xtend Barre and hopes to impart this to her students.